There’ s an old joke about rugby players and oddballs. However, there certainly have been quite a few of them playing rugby in the history of the game. And not just oddballs, there’ s been pitbulls, quiet men, iron men, and unsung heroes. And you can meet them all in this quirky collection of the famous and infamous of the game. Characters include Wilfred Wooller, who, playing in the ‘ 30s, was described as a ‘ juggernaut, leaving a trail of prostrate figures in his wake.’ Then there was Gordon Brown (not the PM), known as ‘ Broonie’ but also as the baby-faced assassin when he first entered the Scottish team in 1696. Right up to Sir Clive Woodward who transformed the England side from amateur to professional – a man who knew his own mind, but didn’ t seem to sure about anyone else’ s.
Using extensive research author John Griffiths wins bonus points for a funny, fascinating, remarkable collection of the good, the bad and the ugly, of the scrums, forwards, fly halfs, flankers and dummy passers. 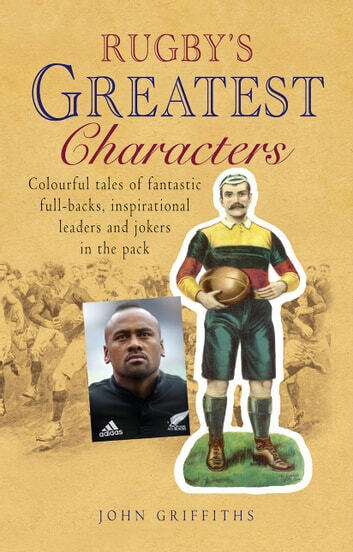 A great gift book for all rugby fans. John Griffiths is the author of six books on rugby and for many years co-edited Rothmans Rugby Yearbook and the IRB's Rugby Yearbook.